What does C&L offer for employee benefits? C&L offers a comprehensive benefits package that includes both medical and dental insurance, life insurance, long-term and short-term disability insurance, and a 401K plan. Employees are also entitled to paid leave, which may be used for vacation and/or paid sick leave. The total annual paid leave entitlement will be as follows, or as provided in the offer letter at the time of initial employment. What is the hourly/salary rate? At C&L Aviation Group we have a wide variety of job types with varying skill levels. Because of this, it can be difficult to provide exact salary rates. For example, an A&P just out of school ranges $17-$19 then goes up with experience. An experienced A&P ranges $23 – $26 with room for negotiation. A painter’s rate can range from $14-$26 an hour, depending on experience and skill. Other jobs at C&L vary based on position, experience and a host of other factors. Your specific position at C&L will determine your daily hours of work. In the hangar, day shift begins at 7 am and ends at 3:30 pm. We also have a swing shift that goes from 3:30 to 11:30. Our warehouse operates from 8:30 am to 5 pm and the paint hangar from 6 am to 2:30 pm, with a night shift from 2:30 pm to 11 pm. The typical office employee at C&L works from 8 am to 5 pm. Because of the large amount of work that we currently have here at C&L there is often opportunity for overtime as well, for those interested. Is there room for advancement within the company? At C&L, you’re more than just a pair of hands. You’re an integral part of our team and future growth plans. As such, there is an opportunity for you to improve and advance with our company. Many of our current employees started here in entry-level positions and through hard work and a positive attitude have advanced into supervisory and/or management roles. We also have several employees who started in one area and transitioned over to completely different branches of the company. Will I get an annual review? At C&L we don’t believe that an annual review is effective. No one should have to wait an entire year for a review of their performance. Nor should they have to wait 52 weeks for a raise if they deserve one before then. We believe that constant feedback about the job that you are doing is the appropriate way to make sure you are achieving your full potential. One of the benefits of being a smallish” company is that your hard work doesn’t go unnoticed. 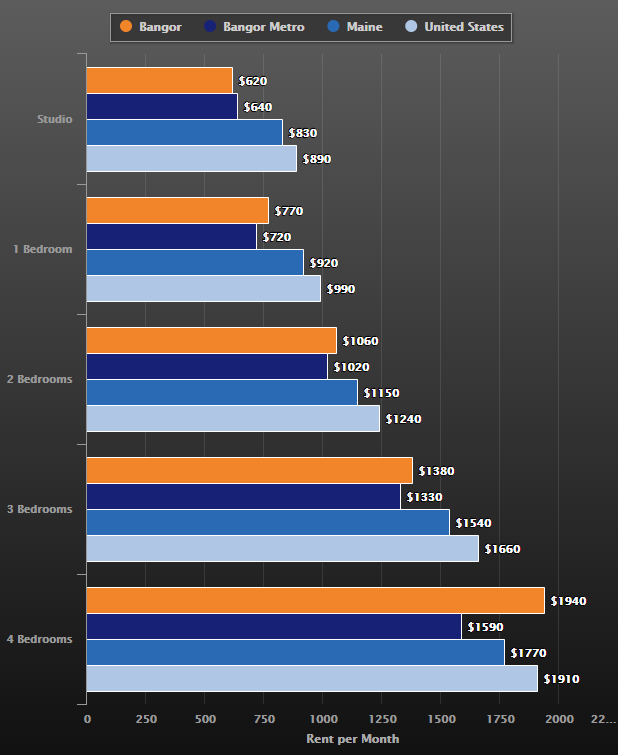 The cost of living in Bangor Maine is slightly below the US average. The biggest factor in the evaluation is the depressed cost of housing. The median home cost in Bangor is $139,200, which is 36% lower than the rest of the country. 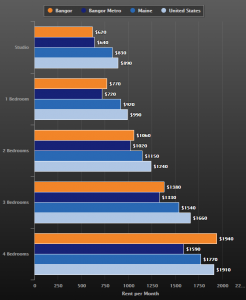 You can also see from the below chart that rent in Bangor is several hundred dollars per month cheaper up to 3 bedrooms. Can I use my accrued vacation time before the first year? Yes, essentially your vacation time is available for use as you accrue it, so if you need a day off after the first month or two you will be able to take one. Time off requests still need to be submitted in a timely fashion for approval, but we want to make sure you are able to take time off when you’d like to. We asked around here at C&L to make sure we answered this one correctly. The word that we kept hearing over and over again was “friendly”. We’re a close-knit group here and everyone is pretty friendly with each other. We don’t have a lot of “office drama” or workplace politics, just people who get along with their co-workers and are happy to be here. At C&L, we host different events that help bring everyone together. The list includes company functions such as picnics, renting out the local movie theater, BBQ’s, a Christmas Party, and regular staff lunches. You’ll also find our CEO on the floor talking to the employees on a daily basis, making sure people are happy and to see if there is more as a company we can be doing. He also makes a big deal out of people’s work anniversary, giving gifts each year as a way to say thank you for the hard work. Alone, all of these are little things, but together they help to create a positive and friendly work environment. Sure we will. We want you to like it here and are happy to help you (and your family) get settled in the community. If you want to do a little looking around on your own here is a short list of websites that offer short-term/weekly rentals in the area.